I want to add a disclaimer before you read any further. I’ve gained some of my followers through my simple rants on film and life. This particular post goes a little deeper and is a bit darker than my other posts so it’s understandable that some may find it unsettling and quite possibly depressing. Lately I’ve been thinking more and more about what Hell would be like if it were real. If you had the chance to see it, would you want to? If you could spend a day there, would you go? Of course, many would instantly turn down such an opportunity. Personally, I wouldn’t be too fond of constant torture and unimaginable torment. 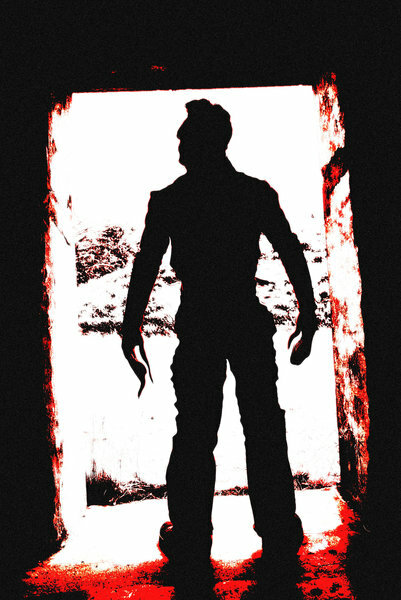 If I were able to visit Hell without the painful repercussions, I’d be there in a flash. Then again, Hell simply wouldn’t be Hell if you didn’t experience it. I believe such a place is beyond our comprehension and to sit behind a viewing glass would be futile. It’s not something you see with your two eyes. It encapsulates your soul and grinds it against flaming spikes and peels the skin from your face, down your back and slices the soles of your feet. The most unsettling experience of Hell would be the complete molestation of the consciousness. Perhaps a stage or method of torment would be the disfigurement of the physical body—but the rules of our world don’t apply here. In Hell, you’re there for the long haul. Eternity as they call it. Your body is forever a slave to the lusts and desires of the demons and entities which reside in the deepest cracks of the darkest voids. Driving on my way to school this morning, I spotted two crosses hammered into the grass next to the highway. I usually never think twice about these things but this particular morning I thought about how morbid it is. At first I considered the fact that such things should be reserved for a cemetery but I remembered these crosses are just simple memorials and reminders to others to be careful on the roads. Maybe they even provide a sense of closure to the family and friends. Anyways, what if we had one of these crosses at the location of every place someone has died? I’m not talking about having them in hospitals and in homes, but public places. Places that you may pass by each day on your way to school or work or the shop. You could be going out to eat and there’s a cross hanging next to a table where a man clutched his chest in horror as his heart gave out, you’re in town shopping and pass by several crosses on the sidewalk where fatal muggings took place. And how horrible would it be to pick up your son or daughter from school and find tiny crosses in the lawn, on the steps, in classrooms and in the cafeteria. It’s even safe to say you may find some in a movie theater. I’d wish to go a level deeper and wonder how many civilians have met their fate to mortars, machine gun fire, car bombs and chemical weapons. In the United States, we hear about this type of things only happening in the Middle East or Africa. I daresay if they happened in America we’d be encountering these cross memorials much more often. And then what purpose would they serve? What could we as a people possibly gain from these constant reminders of death? Would it be an increased appreciation of life or mourning for the dead? What if it’s both? I’m willing to bet several people would argue that is the current state of affairs; we don’t need these memorials to remind us how precious life is or for us to be sad over the dead who we believe died an untimely death. We don’t need these reminders because we have the television and Internet, two excellent news feeds providing each day with morbid realities and distractions to keep us going. It’s a great group of people, friendly and funny! Look at this photograph. Examine the exotic sugar rubies coating the surface pairing well with the marshmallow-white frosting. This elite double team of oral pleasure compliments the freshly baked crust harvested from the wheat fields at the base of Mt. Kilimanjaro. The ingredients are then flown to Venice where specialists examine the acquired goods and, if they’re of only the most exceptional quality, they give the green light for production. Mixed, shaken, baked, sprinkled, and cooled, the finished products endure the packaging process in an underground cellar in Paris where F. Scott Fitzgerald wrote Tender is the Night. One sample is pulled from the batch and flown on a private jet from an unknown hangar at an unspecified time to parliament where the decadent treat is heavily scrutinized by a board of aristocrats and the Royal Family. If visually appealing, it makes it to phase two of inspection. The individual bestowed with the responsibility of tasting the pastry is chosen by the people of the world. Ballots are cast and collected from all reaches of the earth from the Sandwich Islands to North Dakota and the tribes of Budapest. The United Nations serve as a type of electoral college who also perform a full physical on the elected taste tester. After being knighted by the queen of England, the Chosen One is ready for the tasting ceremony. The ceremony takes place at the Vatican in the presence of one first grade class, one UPS deliveryman, a Professor of History (also serving as a scribe to record this momentous event), one scientist, five randomly selected civilians from around the globe, and the Dalai Lama. The Chosen One is clad in only a white silk robe and has their head shaved and tattooed. The world waits. Will it taste good? The Chosen One removes the treat from a gold platter lined with diamonds and sapphires. Sniffs it. Mouth waters. Brings it to their mouth and takes a generous bite. Those in attendance are at the edge of their seats, some begin to perspire. The Chosen One chews for a solid two minutes to fully exhaust their sense of taste. If the pastry is of the most exceptional quality, the Chosen One will drop dead. The first grade class put their hands together and pray that the Chosen One dies. Everyone wants the Chosen One dead so bad. “Don’t ruin this for us,” the UPS man thinks. The Chosen One swallows, loses his footing, and falls to the floor. The Chosen One is dead. Everyone shoots to their feet, roaring with applause. Tears are shed for the martyr that has given the world its greatest gift. A moment of silence for the Chosen One. Moment over. The United Nations alert Kellogg’s that production of Pop-Tarts is to commence immediately. The world weeps collective tears of ecstasy. Babies are born and named after famous flavors. Cookies n Cream, Raspberry, Blueberry, Hot Fudge Sundae, strawberry, AND PLAIN. I rushed to the market searching for a box of Pop-Tarts. I snatched the Strawberry off the shelf and ran out of the store without paying. Sorry. I get home and back-flip up the stairs to the kitchen, rip open the box and unwrap my nutritious breakfast. I fix my eyes on this glorious sight. I cry. I cry because this work of art and personification of the divine is sacrificing itself so that I may, for the briefest of moments, satisfy my empty stomach. 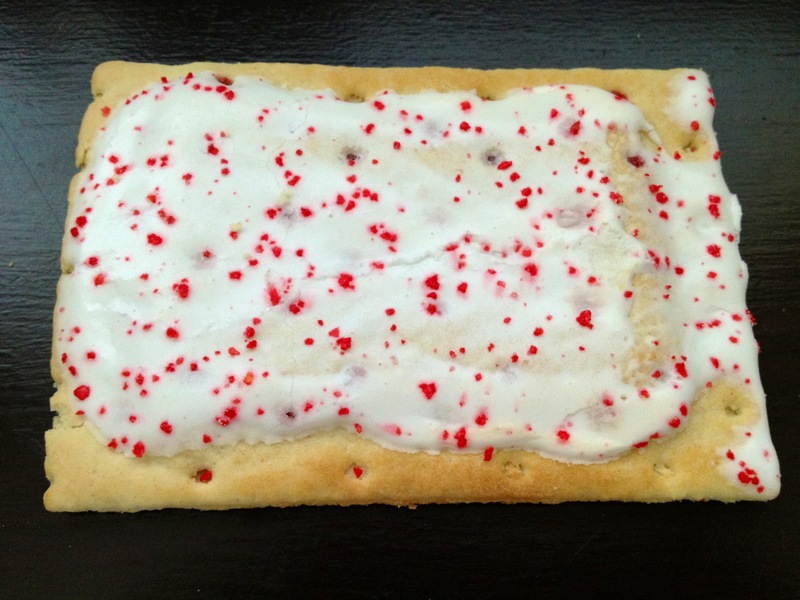 In memory of strawberry Pop-Tart 2/1/2013 1:30 PM – 2/1/2013 1:34 PM.